Picture - Albatros D.Va reproduction built by Vintage Aviator Ltd. The Albatros D.V was a fighter aircraft used by the Luftstreitkrx�fte (Imperial German Air Service) during World War I. 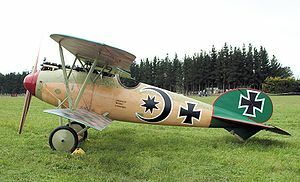 The D.V was the final development of the Albatros D.I family, and the last Albatros fighter to see operational service. Despite its well-known shortcomings and general obsolescence, approximately 900 D.V and 1,612 D.Va aircraft were built before production halted in early 1918. The D.Va continued in operational service until the end of the war. In April 1917, Albatros received an order from the Idflieg (Inspektion der Fliegertruppen) for an improved version of the D.III. The prototype flew later that month. The resulting D.V closely resembled the D.III and used the same 127 kW (170 hp) Mercedes D.IIIa engine. The most notable difference was a new fuselage which was 32 kg (70 lb) lighter than that of the D.III. The elliptical cross-section required an additional longeron on each side of the fuselage. The prototype D.V retained the standard rudder of the Johannisthal-built D.III, but production examples used the enlarged rudder featured on D.IIIs built by Ostdeutsche Albatros Werke (OAW). The D.V also featured a larger spinner and ventral fin. The upper wing of the D.V was repositioned 4.75 inches closer to the fuselage, while the lower wings attached to the fuselage without a fairing. The wings themselves were almost identical to those of the standard D.III, except for a revised linkage of the aileron cables, which were contained entirely in the upper wing. Idflieg therefore conducted structural tests on the fuselage, but not the wings, of the new aircraft. Early examples of the D.V featured a large headrest, which was usually removed in service because it interfered with the pilot's field of view. The headrest was eventually deleted from production. Aircraft deployed in Palestine used two wing radiators to cope with the warmer climate. Idflieg issued production contracts for 200 D.V aircraft in April 1917, followed by additional orders of 400 in May and 300 in July. Initial production of the D.V was exclusively undertaken by the Johannisthal factory, while the Schneidemx�hl factory produced the D.III through the remainder of 1917. The D.V entered service in May 1917 and, like the D.III before it, immediately began experiencing structural failures of the lower wing. Indeed, anecdotal evidence suggests that the D.V was even more prone to wing failures than the D.III. The outboard sections of the upper wing also suffered failures, requiring additional wire bracing. Furthermore, the D.V offered very little improvement in performance. This caused considerable dismay among frontline pilots, many of whom preferred the older D.III. Manfred von Richthofen was particularly critical of the new aircraft. In a July 1917 letter, he described the D.V as "so obsolete and so ridiculously inferior to the English that one can't do anything with this aircraft." British tests of a captured D.V revealed that the aircraft was slow to maneuver, heavy on the controls, and tiring to fly. Albatros responded with the D.Va, which featured stronger wing spars, heavier wing ribs, and a reinforced fuselage. The D.Va also reverted to the D.III's aileron cable linkage, running outwards through the lower wing, then upwards to the ailerons, to provide a more positive control response. The wings of the D.III and D.Va were in fact interchangeable. The D.Va was also fitted with a small diagonal brace connecting the lower section of the forward interplane strut to the leading edge of the lower wing. These modifications made the D.Va 23 kg (50 lb) heavier than the D.III, while failing to entirely cure the structural problems of the type. Use of the high-compression 130 kW (180 hp) Mercedes D.IIIax� engine offset the increased weight of the D.Va. Idflieg placed orders for 262 D.Va aircraft in August 1917, followed by additional orders for 250 in September and 550 in October. Ostdeutsche Albatros Werke, which had been engaged in production of the D.III, received orders for 600 D.Va aircraft in October. Deliveries of the D.Va commenced in October 1917. The structural problems of the Fokker Dr.I and the mediocre performance of the Pfalz D.III left the Luftstreitkrx�fte with no viable alternative to the D.Va until the Fokker D.VII entered service in the summer of 1918. Production ceased in April 1918. As of May 1918, 131 D.V and 928 D.Va aircraft were in service on the Western Front. Numbers declined as production ended, but the D.Va remained in use until the Armistice (11 November 1918). Today, two D.Va aircraft survive in museums. Serial D.7161/17 is displayed at the National Air and Space Museum in Washington D.C., and serial D.5390/17 is displayed at the Australian War Memorial in Canberra, Australia. A small number of Albatros D.V reproductions have been constructed in recent years. One of the most notable flyable examples, finished in the colors of Eduard Ritter von Schleich, is operated by the Old Rhinebeck Aerodrome. It is powered by a modified six-cylinder Fairchild Ranger engine, fitted after the original liquid-cooled Mercedes D.II engine sheared its crankshaft. Bennett, Leon. Gunning for the Red Baron. College Station, TX: Texas A&M University Press, 2006. ISBN 1-58544-507-X. Albatros D.V Pictures and Albatros D.V for Sale.